The Queen’s Beast Coins from the Royal Mint are coveted by both investors and collectors who buy silver. The coins are available with 10 different designs through the course of the program and include bullion options for investors, as well as proof coins for collectors. 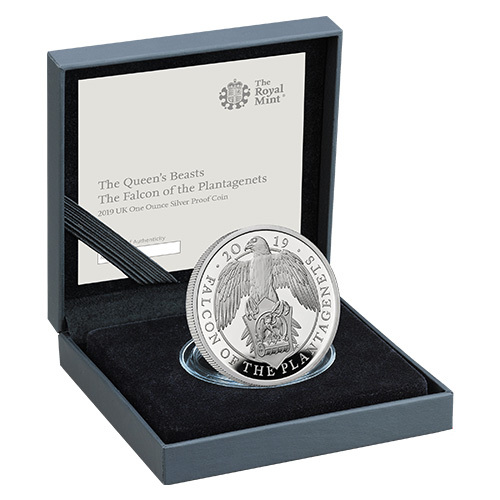 Today, 2019 1 oz Proof Silver British Queen’s Beast Falcon of the Plantagenets Coins are available to you online at Silver.com. Ships to you inside of a commemorative display box with Certificate of Authenticity! Fifth beast design in the Proof Queen’s Beast Series! Mintage limited to 5,500 coins only! The face value of £2 (GBP) is fully backed by Great Britain’s government. The Royal Mint issues the Proof Silver Queen’s Beast Coins in a wider range of options than its bullion counterparts. The 1 oz silver proof coin is the most popular in the collection, with the Lion of England, Unicorn of Scotland, and Red Dragon of Wales designs preceding it selling out in total. The mintage of 5,500 coins for this design is the lowest the Royal Mint has issued to date. All of the 2018 1 oz Proof Silver British Queen’s Beast Falcon coins are available to you inside of blue Royal Mint display cases with black-velvet lining. The coin cases include a Certificate of Authenticity and a booklet that explores the history of the White Falcon of King Edward III. The reverse face of 2019 1 oz Proof Silver British Queen’s Beast Falcon Coins includes the image of the falcon heraldic beast. Adopted by King Edward III as a symbol of his love for hawking, the White Falcon includes a bird supporting a heraldic shield that features a second white falcon. This falcon holds an open fetterlock as a symbol of a rightful claim to the throne of England. King Edward III was one of the 14 kings from the House of Plantagenets to rule over England between 1154 and 1485. Edward III oversaw England’s involvement in the Hundred Years’ War and enjoyed a successful conclusion to the conflict for his kingdom. On the obverse of 2019 Proof Silver British Queen’s Beast Falcon Coins, you’ll find the fifth-generation portrait of Queen Elizabeth II. 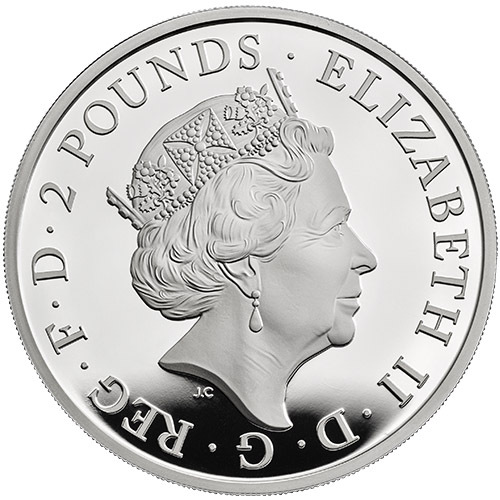 Her Majesty is captured here in right-profile relief in a design created in 2015 by Jody Clark for the Royal Mint.